The PP Blog was hit by a bot attack today bearing multiple IP signatures from Singapore. 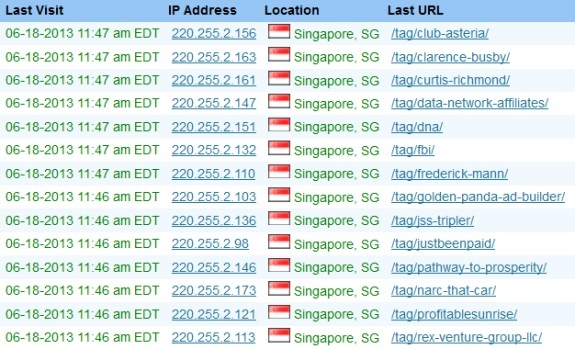 Dozens of Singapore IPs maintained open connections to the Blog for approximately three minutes. Why the Blog was targeted was unclear. The bots sought to call up individual stories and a number of archive URLs. In at least a few instances, the bots appear to have sought unsuccessfully to execute code. Over the years, the PP Blog has been targeted multiple times with DDoS attacks and traffic floods. The Blog also is targeted by spammers at a rate that now is approaching 2,000 per day. In March, for example, the Blog received 34,310 spams. That number increased in April to 51,165. In May, it increased to 56,489, or roughly 75 per hour. Meanwhile, here is a screen shot showing the increase in spam since February 2013. The bitter reality of traffic floods and bot attacks is that they drive up costs and may cause readers to experience slow loading times. With more time spent on maintenance chores, less time is spent on reporting on fraud schemes. That, of course, is exactly what the scammers want — even as some of them try to advance bizarre conspiracy theories. It is proof that you are making a difference and putting a hurt on the scammers and pimps. Please continue with the great work you are doing. Thanks for your note, baylee. It’s good to hear from you.